Pressure cook toor dal for 3-4 whistles, with 1-1/2 cups of water. Mash the dal well and keep aside. Soak tamarind in warm water for about 20 mins, extract the juice and set aside. Boil all the veggies and keep aside (take care to see that they are half boiled). Heat oil in a kadai and add the ingredients for seasoning. Add onions and fry till translucent. Add tomatoes, green chillies and fry for 2-3 minutes. Add all the veggies, dal, turmeric powder, sambar powder, salt, 1 cup of water and mix well and let it cook for about 3-4 minutes. 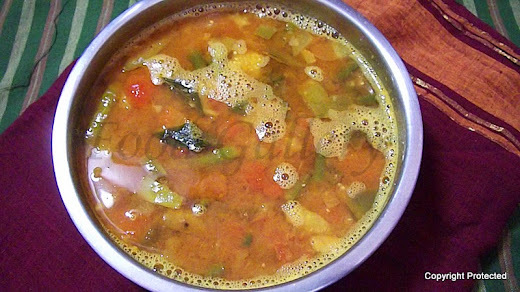 (this sambar should be watery, so adjust the water level accordingly). Now add the tamarind juice and adjust for salt if required and let it cook for another 7-8 minutes. Switch off the flame. 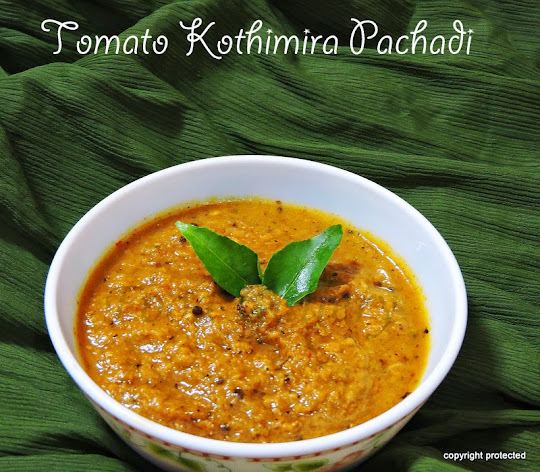 Serve hot with idli, dosa or uthappam. Can use small onions instead of the big ones to enhance the flavor of the sambar. always in for at least 3 bowls of sambhar. so count me in. visit me at my page too.